At CERATIZIT Sacramento (formerly PROMAX Tools) we place a special EDGE PREP on most of our solid carbide end mills. This process allows you to forgo the tedious and long break periods needed on most end mills in order receive the greatest production out of your tool. Combine our edge prep with our superior coatings and the results are clear - longer running precision cutting tools, with fewer tool changes per run, equaling significant cost effectiveness. CERATIZIT Sacramento end mills are manufactured from high strength, submicron grain carbide with a high cobalt content to produce an extra tough end mill which has a transverse rupture strength (TRS) as high as 650,000 psi. Our end mills are eccentric relieved giving them the strongest cutting edge while running cooler and smoother to produce better finishes. The majority of our solid carbide end mills are standard with a 40 degree helix making them stand out from most others. We offer TiCN, AlTiN, ZrN and nACRo® hard coatings on our precision cutting tools which increases tool life while enhancing chip flow and lubricity through the cut. With the advanced CERATIZIT Sacramento end mill design, you can look forward to increased productivity over conventional carbide end mills. Climb milling is the recommended technique of milling. Work piece rigidity is necessary for optimum cutting results. Correct coolant placement and pressure is essential for lubrication through the cut and to assure efficient chip evacuation and a longer tool life. Horsepower to cubic inch removal ratio should be checked for optimal performance. Click Here for Recommended Feeds & Speeds and Tool Selection Guidelines For Finishing Applications. 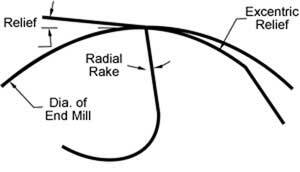 The minimum radial width of cut should not be less than the corner radius of the end mill. When slotting, the axial depth of cut should not exceed the diameter of the end mill per pass. Feeds and speeds are recommendations and should be considered as starting points with possible variations to achieve optimum results. Work piece rigidity should be checked to assure there is no vibration. Check the horsepower available to cubic inch of material removal. The proper coolant flow and placement will wash the chips out of the cut, thus eliminating the recutting of chips, and damage to the end mill. Click Here for Recommended Feeds & Speeds and Tool Selection Guidelines For Roughing Applications.